(Bloomberg) -- Among traditional media companies, no one is making a bigger bet on streaming than Walt Disney Co.
Later this year, the entertainment giant will launch Disney+ -- a third online video service alongside ESPN+ and Hulu -- loaded with movies and TV shows from Marvel, Pixar and “Star Wars.” The Fox film studio and the FX and National Geographic networks also will play key roles as Disney wraps up the $71 billion takeover of 21st Century Fox Inc.’s entertainment portfolio. It’s all part of Chief Executive Officer Bob Iger’s master plan to corral many beloved brands, from “Avatar” to “Zootopia,” and deliver them to the millions of viewers who now stream TV via monthly subscriptions. But challenging Netflix Inc., the online pioneer with almost 140 million subscribers worldwide, will cost big money, especially with Disney digesting Fox. The investments in streaming services will crimp earnings in several ways, reflecting the cost of creating new programming, marketing and delivering the video. Disney will also lose revenue as shows and movies are pulled from Netflix and other outlets. Disney reports financial results on Feb. 5, and management has prepped investors for a difficult fiscal first quarter, which ended in December. Chief Financial Officer Christine McCarthy said in November that profit in the film division could be as much as $600 million lower, due to tough comparisons with the prior year. TV profit will be squeezed by $100 million because of the ESPN+ streaming service, including higher sports rights fees. Earnings for the quarter are expected to be $1.57 share, down about 17 percent from a year earlier, based on the average of analysts’ projections compiled by Bloomberg. Revenue is forecast to shrink 1 percent to about $15.1 billion. Things may not look much better as the year drags on. Last week, Morgan Stanley analyst Benjamin Swinburne lowered his forecast for Disney’s 2019 earnings by 24 cents to $6.83 a share, also a decline from a year earlier. Swinburne, who recommends buying the stock, blames a number of factors, including lower revenue from Marvel TV shows canceled by Netflix and higher interest expense on the company’s expanding debt load. To strengthen its balance sheet and credit rating after the Fox acquisition, Disney is suspending stock buybacks until fiscal 2021 or 2022, meaning investors can no longer count on repurchases to bolster earnings per share. Swinburne estimates the new services will require $1 billion in additional programming and $500 million in marketing support in 2020. Burbank, California-based Disney also will lose $1.1 billion in revenue from program sales to rivals. Disney hinted at how much the investments in streaming are costing in a filing this month. The company’s new direct-to-consumer division, which includes its international TV channels as well as its online video ventures, lost $738 million on sales of $3.4 billion for the fiscal year that ended in September. Hulu is a big contributor to that red ink. The service, which will become the online home to more adult-oriented Fox content, just lowered the price of its entry-level subscription by 25 percent to $6 a month. While that may attract customers, it also means Hulu will be a bigger drain on earnings when Disney assumes majority ownership through the Fox deal. “It’s going to a bigger drag on their profit,” said Geetha Ranganathan, a Bloomberg Intelligence analyst. All of which explains why Iger recently restructured the company’s executive compensation, shifting the focus away from profit growth to making more quality programming for the new services. Disney shares are up 1.1 percent this year, trailing the S&P 500 Index’s 5.5 percent gain. They’re also 8.9 percent below the closing high of $121.69 that they hit in August 2015. 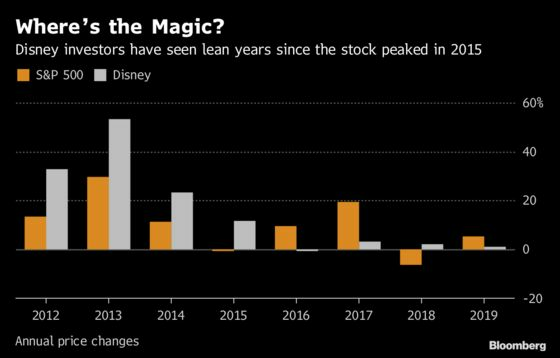 Unlike many media companies that have traditionally been valued by investors based on what they would be worth if sold off in pieces, Disney has been historically prized for its earnings, Gabelli’s Marangi said. This year may prompt investors to look at other measures, such as the number of subscribers to its nascent streaming services, he said. Some longtime Disney shareholders say Iger should be making the investments now, and they are OK with the short-term earnings pain.